Sago Plum Pudding, an old-fashioned dessert made from simple ingredients, is one of my all-time favourites. I think its origins must be Antipodean as I never came across it when I was growing up in England. Some in our family see it as an excuse to eat Brandy Butter when it’s not Christmas. I’ve never been a big fan of Brandy Butter and prefer it with thick, unsweetened cream. I like to make individual half cup puddings rather than one large one. They keep in the fridge for several days and are quicker to cook than steaming one large pudding. I love being able to whip one out of the fridge, zap it in the microwave and demolish it whenever the mood takes me, which is quite often when I know they are there! This recipe came from my mother-in-law. Soak sago in milk overnight. Place butter in a mixing bowl and zap in the microwave to melt. Mix in remaining ingredients then scrape into a one litre pudding bowl, lightly buttered. Cover with a piece of buttered foil, buttered side down and place in a large saucepan on something to lift the bowl slightly. A metal trivet, old saucer or a small brick will do. Add boiling water to come halfway up bowl. Cover with the saucepan lid, bring to the boil and steam steadily for 3-3½ hours, adding more water as necessary. The top of the pudding will have an even dark brown colour when ready – lift foil from time to time to check. Stand for 5 minutes then turn out, cut into slices and serve with thick cream, Brandy Butter or custard. Note: make individual puddings in 8-10 half cup ramekins, dariole moulds or Chinese teacups, lightly buttered, as shown in the second photo. Fill almost to the top as they don’t rise much. Place in a shallow ovenproof dish and add boiling water to come halfway up the cups. Cover the whole dish with a sheet of foil, buttered side down. Bake at 160°C for an hour to an hour and a half, or until evenly rich brown on top. Tip out and serve immediately or store covered in the fridge and reheat for about a minute in the microwave, covered in plastic wrap, then tip out. This entry was posted in Recipes and tagged dessert, easy, family, pudding by Linda Peek. Bookmark the permalink. 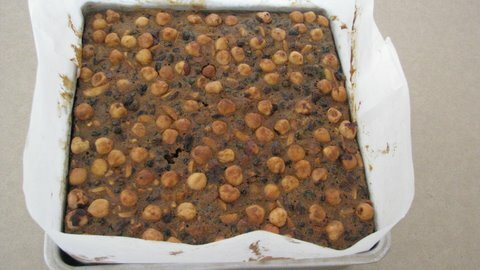 We grew up with this as a lighter version of Christmas pudding at other times of the year. We live in Ireland with English family connections so I think it may have started out as a northern hemisphere offering! At the end of the day, who cares! It’s just too gorgeous to worry about it!!! I plan to try it your way in individual pots, great idea! Thanks for sharing the recipe. My Mum used to make it and I’ve kept the tradition going. I much prefer it to the heavy style of plum pudding. We have it with a lemon cream that’s really easy to make by whipping up cream with castor sugar (so it’s sweet to taste) and lemon rind. Just before it’s fully whipped squeeze in some lemon juice. 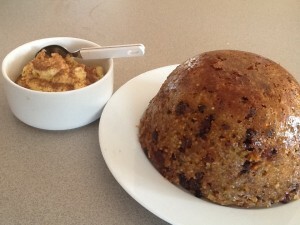 It’s delicious and the perfect accompaniment to sago plum pudding.